A powerful rejuvenating 24 carat gold massage gel that helps improve blood circulation and restores softness, smoothness and radiance. It helps to improve the quality of cell regeneration and brings glow while making skin look younger. 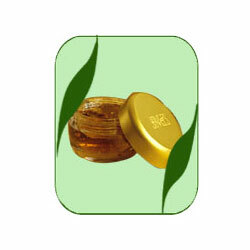 Massage gently Gold Gel into the face using upward and outward strokes. Use once a day for youthful and flawless skin. 24 Carat Gold Leaves, Aloe Vera, Wheat Germ Oil.